Earth’s Magnetic North Shifting Rapidly – What’s It Mean for GNSS Users? Blog Editor’s Note: Thanks to member Mitch Narins for this informative post. This important work is yet another essential effort being delayed by the US government shutdown. airport runway end numbers and markings, which are based on magnetic headings, need to be periodically updated, as do charts used in air, land, and sea applications to ensure that the relationship between magnetic compass headings and other navigation system information (e.g., Global Navigation Satellite Systems) is properly understood and used appropriately. The most recent version of the World Magnetic Model was released in 2015 and should have been satisfactory until its scheduled update in 2020, but the north magnetic pole has moved more quickly than expected, requiring that an update be released this year. Previous movements had averaged 15 km per year, but in recent decades, the pole has moved at a rate of 55 km per year. It is also believed that a geomagnetic pulse under South America in 2016, which occurred after release of the 2015 model, made the problem worse. The chart to the left, provided to Nature magazine by the World Data Center for Geomagnetism/Kyoto University, depicts this movement. 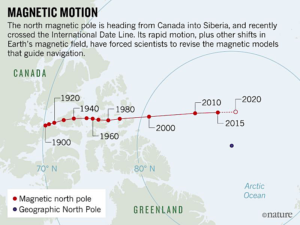 As the Nature article on the subject notes, the magnetic pole crossed the International Date Line in 2018 and “is currently making a beeline for Siberia.” The unexpected rapidity of change most affects operations in the Arctic regions, where compass needles can even point south at points north of the magnetic north pole. Frank van Diggelen at Stanford’s annual PNT Symposium, where he noted that Columbus’ lack of understanding of magnetic variation caused his ships to sail on a southwesterly tact rather than true west, which allowed the “discovery” of land prior to being forced to turn back by mutinous crews. The chart to the right (provided by the National Oceanic and Atmospheric Agency (NOAA)) shows the extent of the variations worldwide based on single model version perspective. Magnetic declination can be positive or negation, i.e., depending where you are on the Earth. Therefore, to determine true north, you may need to add or subtract from your magnetic heading. You can access a current model to determine the magnetic declination at any point of the Earth at http://www.magnetic-declination.com. Mr. Gabbatish’s article states that “The changes [to the model] are essential, as the system is used by aircraft, ships and even smartphones, which make use of the Earth’s magnetic field to establish which direction someone is facing.” I agree that maintaining the model is important and that updating magnetic variations (MAGVAR) on charts and in electronic navigation systems is important. 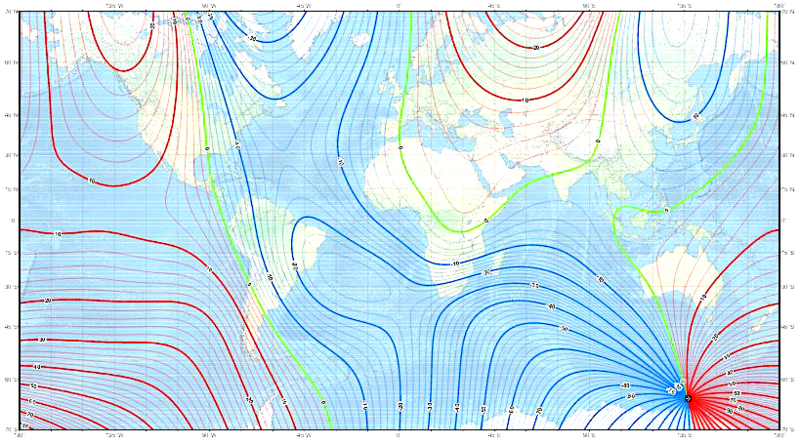 However, in an age where many modes of transportation are using satellite-based navigation as their primary, and in some cases sole means of navigation, how many of these systems actually (in Mr Gabbatish’s words) make use of the Earth’s magnetic field to establish which direction someone is facing, and do they use the World Magnetic Model. What affect does the magnetic north pole movement have on GNSS users? As with most things, it depends. It depends on the user, the user’s operational environment and regulatory framework, and even the effect on other equipment in use (e.g., inertial reference systems). The receiver computes directions referenced to True North (also known as geodetic north). The Magnetic Variation Correction command (MAGVAR) is used to navigate in agreement with magnetic compass bearings. The correction value entered here causes the “bearing” field of the navigate log to report bearing in degrees Magnetic. The receiver computes the magnetic variation correction when using the auto option. The receiver calculates values of magnetic variation for given values of latitude, longitude and time using the International Geomagnetic Reference Field (IGRF) 2015 spherical harmonic coefficients and IGRF time corrections to the harmonic coefficients. (IGRF-2015 is also referred to as IGRF-12.) The model is intended for use up to the year 2020. Interestingly, Novatel also notes that “The receiver will compute for years beyond 2020, but accuracy may be reduced.” Given recent information, this warning may need to be updated – at least until the new model becomes available. As the accuracy of the GNSS receiver’s magnetic heading is directly linked to the correctness of the model, the effect on users will vary depending on their specific missions and the MAGVAR “error” at the specific location on the Earth where they are operating. In one application, a user may have “issues” walking down streets that were laid out in a grid pattern based on magnetic north. A ship navigating into a harbor and making heading adjustments based on magnetically referenced charts could be more critically affected (no disrespect to harbor pilots intended). In fact, many applications still rely on heading information: air navigation in the terminal area (including approach and landing); marine navigation; machine guidance; drilling and excavations; satellite and communications antenna pointing; robotics; and even autonomous vehicles. 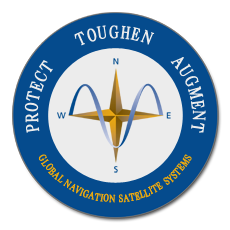 While reliance on actual magnetic-driven heading systems has somewhat waned as GNSS-based true heading systems have been readily adopted, maintaining magnetic compasses would seem quite logical from a resilience perspective given that jamming or spoofing a compass would seem an enormously difficult task. Even in a SatNav-centric world, a magnetic compass certainly makes for a simple GNSS spoof detector showing if the magnetic and derived-magnetic headings diverge. The need to maintain magnetic compasses and the World Magnetic Model, and properly integrate them into applications, remains an important endeavor – even at a time when satellite-based navigation systems seem to offer sufficient solutions. With the magnetic north pole’s increasing rate of movement, it may be necessary to revise the model on a more frequent basis and ensure that updates can be quickly incorporated into user equipment. Bowditch, Nathaniel (2002). American Practical Navigator. Paradise Cay Publications. p. 849. ISBN 9780939837540.